-------------------------------------------- This gem of a plant usually only produces single bloom, instead of a multi-bloom, but this flower is a sight to behold. Small flower produces a slightly striped throat. Color is more light lilac than purple. Will make great gift plant. A jewel of an orchid. 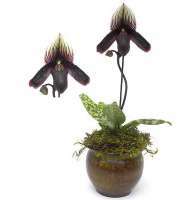 Yes the Dark Maroon Lady slipper is the closest we can come to producing a "black orchid". So you will have to settle for this dark maroon beauty. It ships in this elegant round container and is decorated with Spaghnum moss. We have added many new orchid plants.From new paphs (lady slipper) orchids, to phalaenopsis and some new oncidiums. The cattleyas this time of the year are usually not in bloom and are sent as mature plants with buds. They will usually open within 4 - 6 weeks. Do you have a knack for being with moths? Most people would say, "no way". Yet, the moth orchids that I am talking about are the ones that sway nicely in the breeze and some of the newer hybrids have a nice fragrance. These moths are easy to care for, especially a beginner. These moths are found very frequently in gardens. These are the phalaenopsis orchids. The best light is indirect light. It can be bright but not direct sunlight. If you have a west facing window sill this will do just fine. Direct sun can damage the leaves of the moth orchid. Humidity is needed for the moth orchids. They actually grow in the wild in humid rain forests. In the warm months it would be nice to mist them every day or two. They also enjoy a bright bathroom. Let's look at the temperatures that phals like. 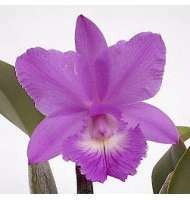 They are an intermediate temperature orchid. This means they like temperatures from 55 to 75 or 80 degrees. As a must, the must be a temperature gradient of 10 to 15 degrees for at least 14 days in the fall to stimulate their flower spike. Moth orchids have no pseudopods to store water and for this reason they should not completely dry out. It is fine line to let them nearly dry out and at this point water them. You should be able to tell by seeing how light the plant is before you water it. Another way is stick your finger tip down about an inch into the plant and it should feel almost dry. It is at this point you should water. Let the water run through the plant (in the top and out the bottom) for about 20 - 30 seconds. 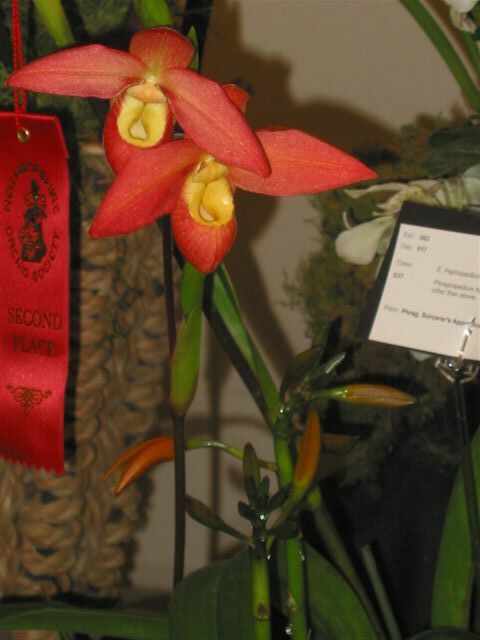 It is important that any orchid plant does not sit in water because it will get root rot. 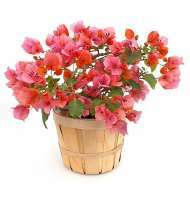 Fertilize the plant twice a month with a week fertilizer solution. It is recommended to cut amount of fertilizer recommended by one half. Fertilize about every other week with a balanced fertilizer except durng the summer months of growth when you can use a high nitrogen fertilizer. This is a phrag hybrid called "sunview" Isn't the waxy sheen on this paph really pretty? If you have any pictures you'd like to share please email to me. Also if you any questions or suggestions for future newsletters please let me know.